On Thursday, November 22, the American civil holiday Thanksgiving, the interim Administrator of the Patriarchal Parishes in the USA, Bishop Matthew of Sourozh celebrated Divine Liturgy in St. Nicholas Cathedral in New York City. 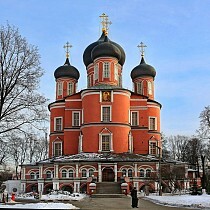 His Grace was co-served by cathedral clerics as well as Abbot Jonah (Zaimovsky; director of the Alcohol and Narcotics Help Center "Metanoia" at St. Daniel's Monastery in Moscow). Praying alongside parishioners were residents of the St. John of Kronstadt House of Mercy, founded under the auspices of the "St. John Give Hope Foundation" and the Patriarchal Parishes in the USA. After the Liturgy, Bishop Matthew addressed the faithful with a sermon. At the conclusion of the service, all were invited to a festal luncheon, served in the traditional American form on Thanksgiving Day.